The HQRP Grow Panel is the perfect tool in growing plants to maximum health and full potential. 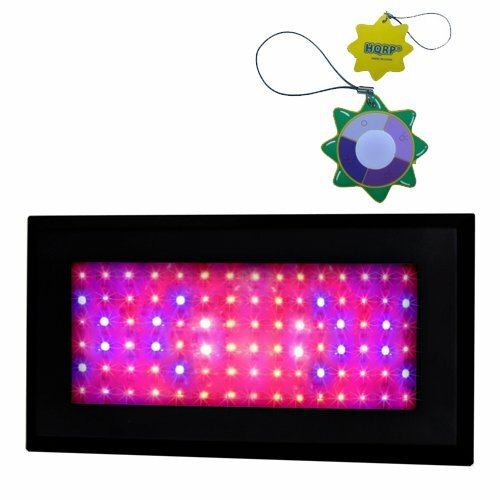 The combinations of red, blue, orange, white, UV and IR LED lights have been formulated to provide a beneficially synchronized effect on the plant. The Blue LED lights (460 nm) provide peak chlorophyll absorption in the plant, promoting vegetative growth. The red and orange LED lights (610 nm) cause large absorption of nutrients by chlorophyll, most critically influencing the photosynthesis process, which in turn promotes budding and flowering. The white LED lights (12000K) are useful for your plants to absorb other lighting spectrums as supplementary like natural sunlight. IR light (730 nm) is needed for plants that bloom to produce healthy flowers. Infrared light heat penetrates plant cells and promotes healthy growth. UV light (380 nm) can mimic sunlight and fool plants into growing much more efficiently. Photosynthetically Active Radiation (PAR) is a measure of the photosynthetic photon flux (area) density, or PPFD. Higher PAR promotes plant growth, and monitoring PAR is important to ensure plants are receiving adequate light for this process. Three built-in cooling fans, integrated suspension hanging system. 100 Days Warranty.